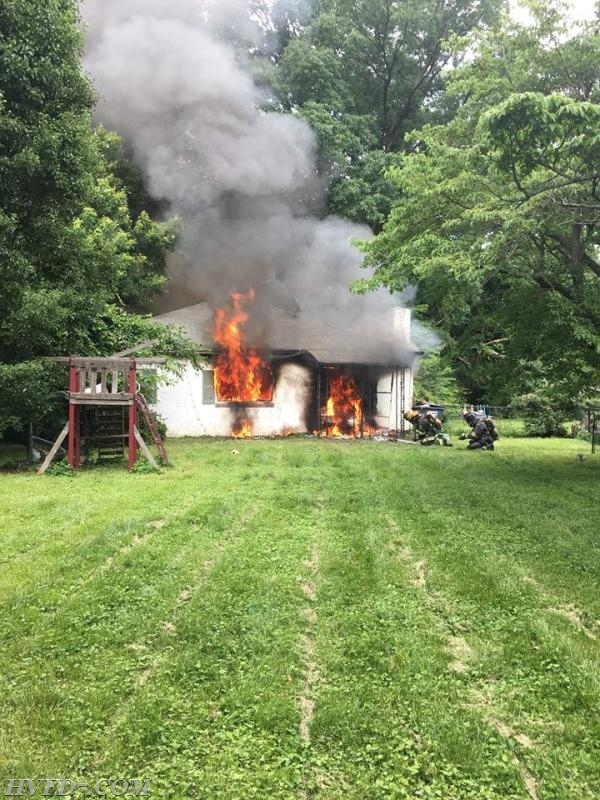 At 1702 hours Engine 7, Truck 7, Tanker 7, Squad 7, Tanker 2, Engine 2, Tanker 1, Truck 1, Charles County Squad 2, Charles County Tanker 2, Engine 3, Ambulance 79, and Ambulance 29 were alerted to the 27000 block of Barton St for the reported house fire. Engine 72, Tanker 74, Truck 7, Squad 7, Chief 7, and Deputy Chief 7 responded shortly after dispatch with 20 volunteers. Chief 7 arrived on location to find a single story single family home with fire showing. After a 360 of the structure was complete Chief 7 advised there was heavy fire from sides Alpha, Bravo, and Charlie and he assumed the 'Sandgates' command. Tanker 74 arrived shortly after and advanced a 200' 1 3/4" attack line to the front door on side Alpha. Chief 2 arrived and assisted the crew from Tanker 74 with the initial attack and was giving the 'Attack Group' supervisor. Engine 72 arrived and stretched another 200' 1 3/4" attack line from Tanker 74 and assisted the crew from Tanker 74. Truck 7 arrived and began a primary search of the structure while venting for the crews operating on the attack lines. Squad 7 arrived and was advised to send their crew to side Alpha and assist with opening up the ceilings and walls to check of any extension. The primary search of the residence was complete with negative results. The attack crews did a great job with their aggressive attack and had the fire knocked within minutes. Units from Company 7 remained on the scene to do an extensive overhaul of the residence and to assist the Fire Marshall with their investigation. Units from Company 7 were held in quarters at 1912 hours.